In a recent call to brief me on these changes, Nicole Black, legal technology evangelist at MyCase, and Matt Walton, director of marketing, said that the company’s product development roadmap continues to be heavily influenced by customer feedback. Many of these most-recent changes came about through customer suggestions and interviews, they said. Here are the major changes to MyCase since April. 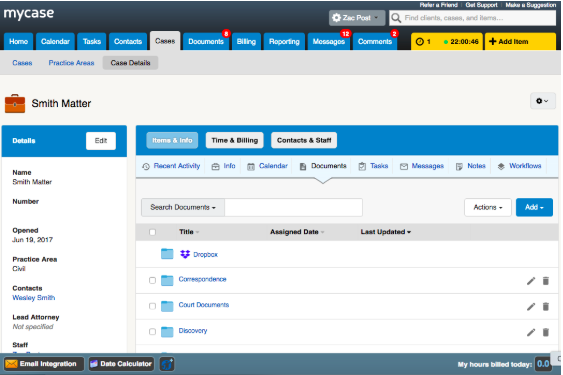 Among the most-recent changes to MyCase is the ability for firms to track prospective client leads. This feature allows users to enter information on a lead, much like they would for a contact, and then track and follow-up with the lead. If the lead becomes a client, then the information can be converted to a contact. When you add a lead, you can identify its source and then track its status. For active leads, you can see various analytics, such as how many have been converted this month versus all time, how many have been added this month versus all time, your top-three referral sources, and the number of leads associated with each of the top-three sources. Analytics can also be set to show the last 30 days instead of the current month. MyCase introduced lead tracking just this month and continues to build it out based on customer feedback, Black told me. MyCase users can now link their Dropbox accounts. Once they do, all of their open cases in MyCase will have a Dropbox folder. Within that folder, users will be able to see all the files and folders for that case stored on Dropbox. By clicking on the Dropbox icon next to a document, they can open the document in Dropbox Online for viewing and editing. Documents can also be accessed and edited directly within Dropbox, either in the cloud or using the desktop app, and any changes will be reflected in MyCase. Staff calendars can now be viewed in the mobile app. Previously, users could see only their own calendars in the app. Now they can see the full staff calendar. Firm and case documents can now be viewed, emailed and texted from the mobile app. Timers for capturing time are now available in the mobile app. MyCase continues to add to the selection of reports a firm can create, with 15 now available. The two latest to be added are case revenue reports, to show the financial performance of a single case, and fee allocation reports, to see how the individuals who have billed for a matter contributed to the overall revenue collected for the case. In addition, the case list report has been updated with the ability to add any custom field for a case as a column. The report can be further customized by moving columns and deselecting default case fields. Other reports previously available in MyCase are aging invoices, accounts receivable, user time and expenses, firm time and expenses, case time and expenses, trust account summary, trust account activity, non-trust retainer and credit account summary, non-trust retainer and credit account activity, case list, statute of limitations, electronic payments, and credit card fees. LEDES billing is now available so that users can generate invoices in LEDES 1998B format. After enabling LEDES billing globally for the firm, which is done within the client-billing settings, LEDES billing can be selected for any case and will have all UTBMS codes available for use when entering time. 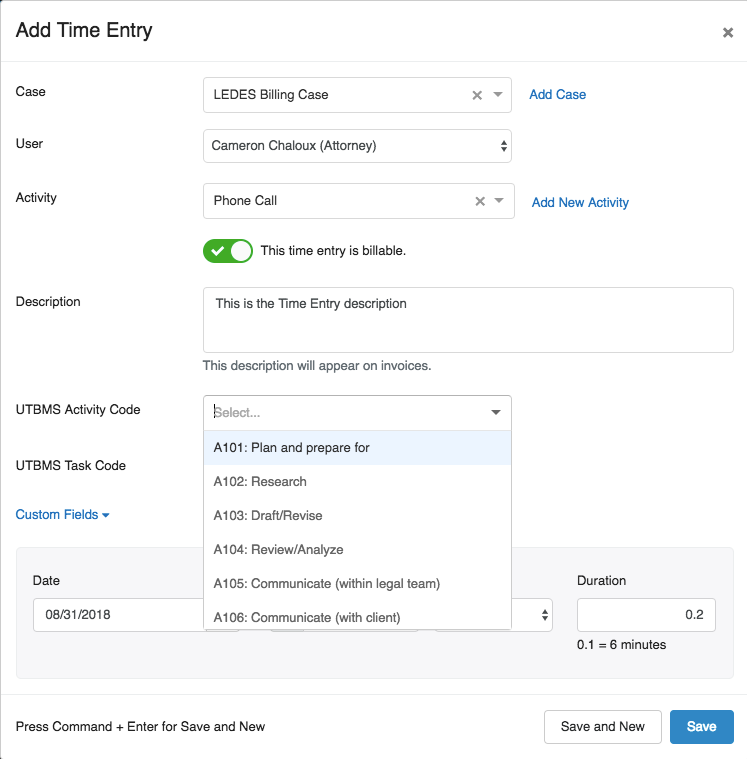 For cases in which LEDES billing has been activated, when the user goes to create a time entry, the user will see fields for entering the activity code, task code and expense code. When a bill is created for the matter, it will be formatted for LEDES with the appropriate UTBMS task and expense codes. Users can now set automated billing reminders to remind clients that an invoice is overdue. Earlier this year, MyCase added the ability to send billing reminders, but the reminders had to be sent manually. Now, reminders can be sent automatically. These reminders are turned on by default for all new matters. The default is to send an automated reminder seven days before the due date, on the due date, and seven days after the due date. Firms can customize the reminder schedule. Users can now save a default activity description. Then, when entering a time or expense, if the user leaves the activity field blank, the default activity will be automatically entered into the field. Users can create invoices without creating a corresponding case, so that they can send an invoice unrelated to a pending case. Recent invoice activity now appears on the dashboard. 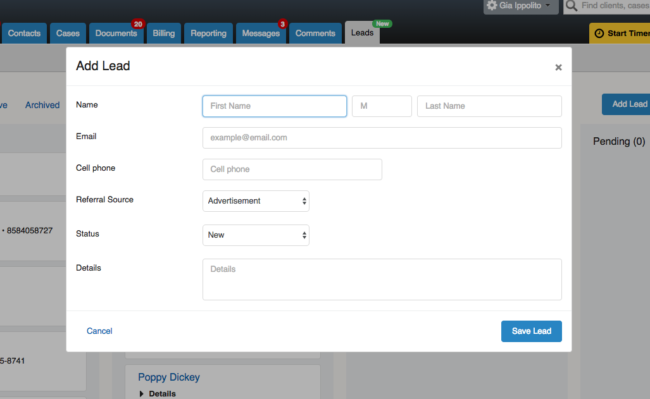 Users can add custom messages when emailing invoices. Users can now create case stages to help them track the movement of a case through its lifecycle. Users create their own sets of case stages and can have multiple sets for different types of cases and different practice areas. For example, case stages may be Discovery, Pretrial, In Trial and Settlement. As a case moves through its stages, users can update the information so that everyone in the firm can be aware of where the case stands in its lifecycle.